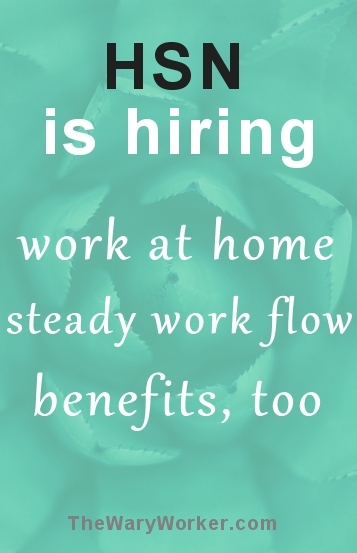 Want a full-time work at home job ? One that has a steady flow of work ? And has a full benefit package ? I came across a pretty good one this morning. HSN is hiring full-time, home based Customer Service Representatives who are willing to play a vital role on the front line of service. The pay is not indicated but my research tells me the average salary is about $12.00 an hour. Considering you don’t need previous experience, this isn’t too shabby. HSN is a multi-channel retailer, most famously known for their televised shopping show where they present for sale everything from fashion to home goods to jewelry (channel 240 on my Directv ). Right now, there are at least 40 job listings for this remote position so it looks like they are going through a big hiring kick. Good news for us, right? This is an inbound customer care role where you will enthusiastically answer questions, troubleshoot problems and provide positive customer service. To be eligible, you must live in Florida. Specifically, in the counties of Pinellas, Hillsborough, Pasco, Hernando, Sumter, Citrus, Polk, Hardee, Desoto, Manatee, Sarasota, Orange, Seminole, Brevard, Volusia, or Osceola. You also need a High School diploma or GED, have a home phone number, and high speed internet. You have to be a good listener, be willing to take personal initiative to achieve goals, and maybe even do a little bit of up-selling. Which isn’t hard once you know what products works well together. Computer and headset compatible with HSN specifications. High speed internet connection. For the sake of call quality, satellite, broadband, wireless or dial up services are not an option. Standard copper line phone service from a local phone company or bundled service from your internet provider. Don’t have a headset ? Don’t even know where to look for one? HomeAgentHeadsets.com is a great resource. Plus, if you scroll down the page, they have an HSN AGENTS link that will give you some headset suggestions specifically for HSN. And…not only do they have a nice selection of benefits – like paid time off, health and retirement plans – they give their employees discounts on merchandise. What do you think? Sound like a job you can sink your teeth into? Click here to learn more and to apply. 8 Non-Phone, Work At Home Jobs Hiring NOW !